Printmaking, by nature, is a medium full of contradictions. Creating a matrix that can reproduce hundreds of copies of a single image inexpensively, without the assistance of digital technology, makes it one of the most utilitarian media. It can also be incredibly technically cumbersome: techniques like intaglio and lithograph require a deep understanding of chemistry and material. As a medium it provides access to a wide range of rich tone, texture, and mark, but can take years to master. 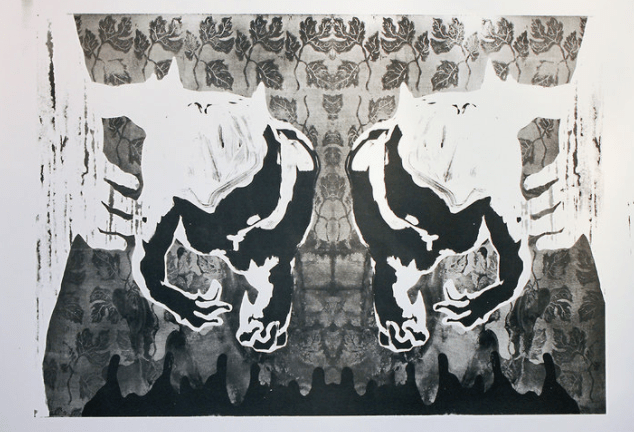 In Fold: Ten Conversations, artist Ivanco Talevski gathers ten friends, colleagues, and teachers in a collaborative creative investigation of the printmaking medium as a way to engage different ideas and ideological approaches to printmaking. Beyond a consistent sense of connection with material and materiality, the work maintains a collective sentiment of political awareness, and an undercurrent that references printmaking’s roots as a vehicle for disseminating information. It also champions the possibilities within flexibility and reinterpretation of artwork. All of the artists in the exhibition opened not only their practice to Talevski, but completed work as well, which he reinterpreted to make new work specifically for this exhibition. Talevski has influenced everything in this exhibition in some way, either directly or indirectly, exploring the role of printmaking as a vehicle for communal image-making. In lyricalwars, poems that address racial bias and police brutality written by an artist who goes by the name “mouth” have been translated into a large copper book, fabricated by Talevski. 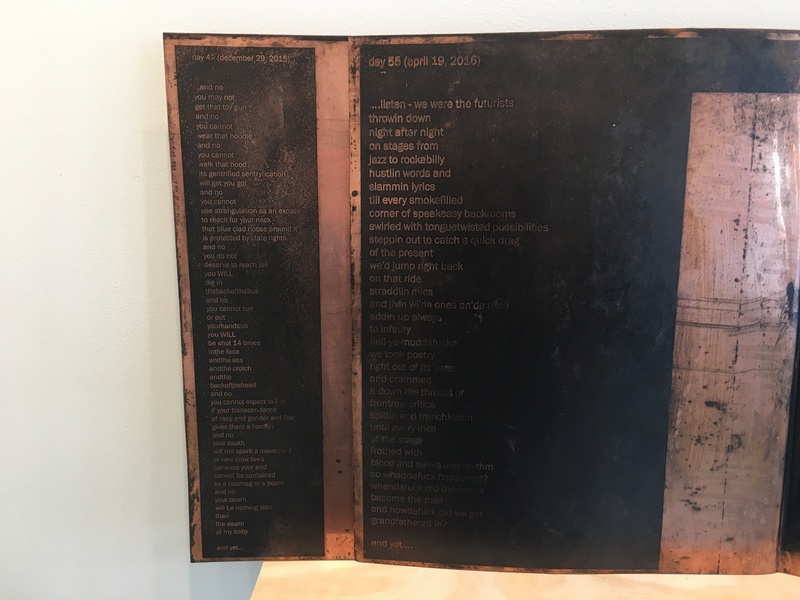 The piece operates as an homage both to the intaglio copper plate (rarely seen outside of the printmaking studio) and an epic record, turning mouth’s stream-of-consciousness poetry into something almost biblical in its size and intensity. Beyond monumentality, this plate is a matrix with the potential to proliferate these words and the disturbing realities they describe, a powerful analogy for the spread of awareness of police brutality in this country. 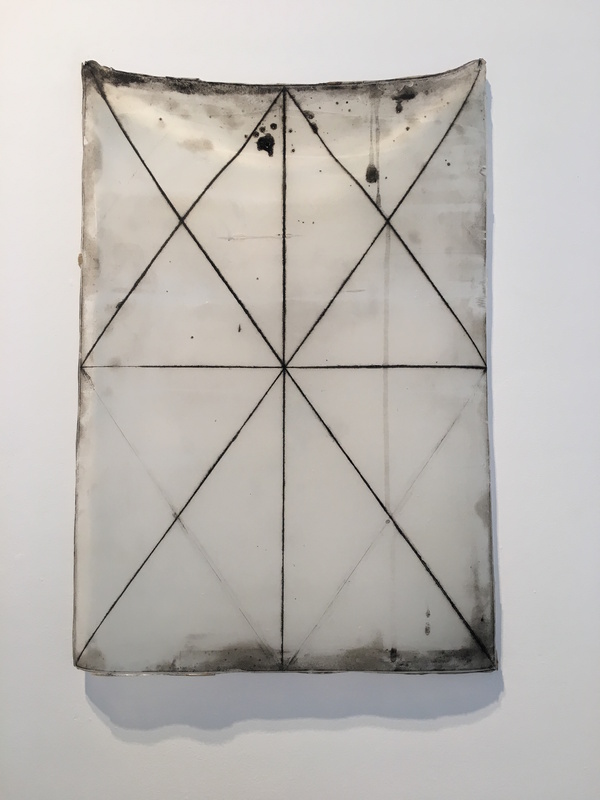 A zinc plate created by the late Hitoshi Nakazato was discovered by Talevski in storage at the University of Pennsylvania (where Talevski was Nakazato’s student) and used to create Untitled, a print on a dried film of acrylic gel. At once arrestingly artificial and ephemerally beautiful, with the weight and translucent qualities of rice paper, the resulting piece is a contemporary reimagination of this traditional material. Similar to rice paper, acrylic gel absorbs errant marks and plate tone in the same sensitive manner, which imbue the piece with a memorial quality, reactivating Nakazato’s hand. Central to all of the work in Fold is drawing; while the act of printmaking is the connective sensibility, the drawing hand is the collective philosophy behind the curation. Beginning with Talevski’s High Steps, a graphic, dusty drawing that clearly communicates the feeling of rendering with charcoal, the material sensibility and handiwork of each artist is on full display. 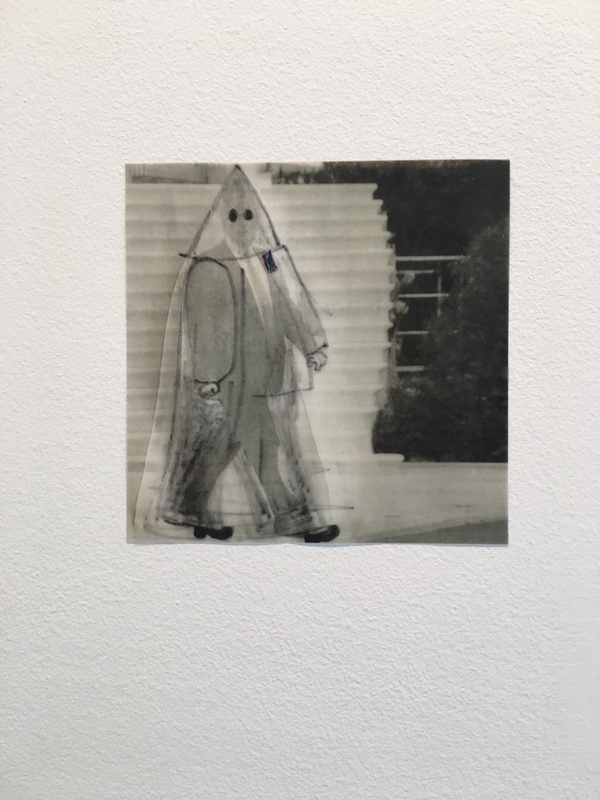 Sarah McEneaney’s August 15, 2017, 8:10 am is one of a series of images in which the artist transforms a newspaper photograph of Donald Trump into something other than himself with scrawled, scribbled lines – in this case, a Klansman. Talevski translated McEneaney’s image into a digital print, encasing her Twombly-esque lines by dipping the paper into hot wax. This decision imbues the five-inch square image with an added element of reverence and permanence, making it sculptural, almost like a wall-mounted idol. A painterly serigraph (or screen print) by Didier Williams demonstrates the way the print can operate in conversation with drawn and painted mark. Cinched at the waist, We both features an inky, Rorscharch-like image of a doubled creature advancing from a hallucinatory repeated pattern of foliage, all within the silhouette of a torso with hands at its waist. Rendered in what appears to be a combination of brushstroke, relief carving, and smudgy shading, the pattern of imagery simultaneously enhances and conceals a narrative. On the opposite wall, Matt Neff’s Historical Pause also speaks to the depth and range of mark available to the printmaker, but in the language of the laser-print photocopy. 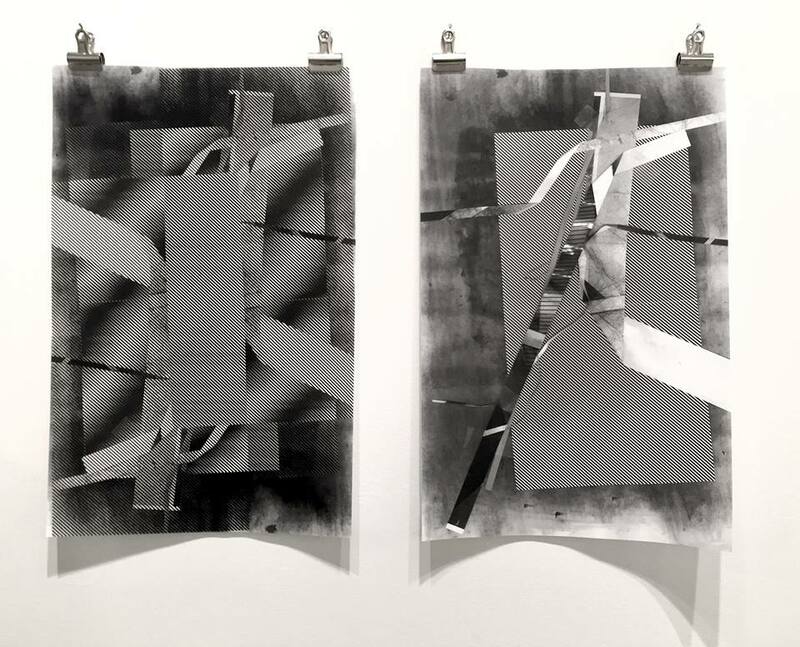 Using a collection found scraps of paper and “ephemera,” Neff arranges the pieces directly on the bed of a photocopier. The resulting images are collage-like, black and white compositions that are sensitive and self-referential, creating their own kind of trompe-l’oeil sensibility within the context of complete abstraction. What Fold brings to the fore is an active, rich conversation between makers, as chronicled and facilitated by Talevski through his own artistic development. By pulling in artists from throughout his life, from his childhood in Macedonia to his college professors to his colleagues at University of Pennsylvania, it is at once a broad exhibition and a deeply personal portrait. It is a familiarity with all of these artists and their work that has allowed Talevski to engage in these conversations. The work here is permeable, malleable, accessible – never untouchable. Each of the pieces brings something to the conversation: a particular sensibility of mark, an approach to construction, a new way of looking. Fold is imbued with a feeling of collaborative experimentation that feels in part a result of the space it is exhibited in. CR Ettinger Studio is the space of Cindi Royce Ettinger, a career printmaker who uses the storefront space as a modest gallery while the back is an active print shop – the only professional etching studio in Philadelphia – where she works as a master printer. Seeing these works in this context again connects the viewer with the act of making, and the generative nature of an active studio. 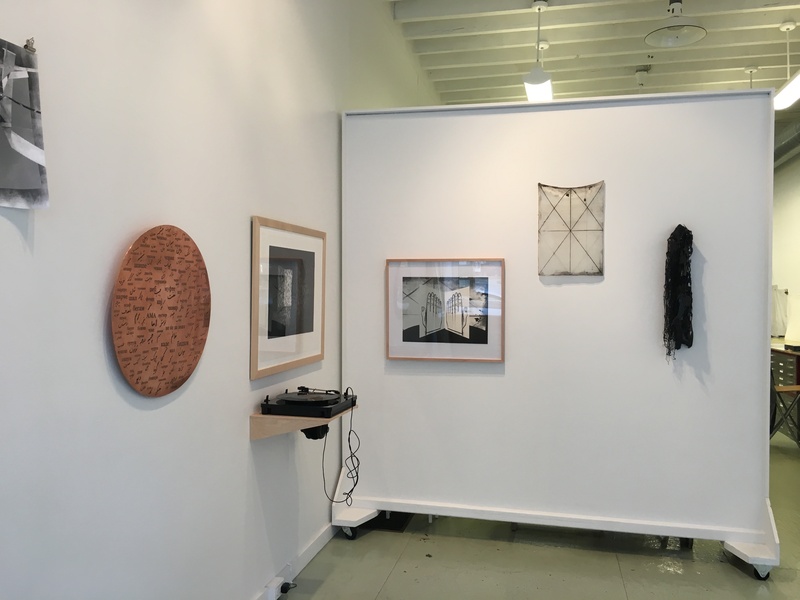 In celebrating the use of printmaking as a tool for investigation, Fold also celebrates the potential of community built from the exchange of ideas, the sharing of work, and the possibilities opened up through collaboration.